Having visited Copenhagen for MBCC last year, we had already spent some time drinking at Fermentoren, along with many of the other people who came along to the festival. It’s a popular hangout for brewers and visitors during the Beer Week. One of the original craft beer spots in Copenhagen, it’s always a great bar to discover both up-and-coming Danish breweries and beers from many of the best breweries around the world. This time though, we’re visiting for a more exciting reason than just to share a pint. As part of our Great Mikkeller Box at Beer52, we’re including a bottle of Dry and Bitter’s awesome Christian Bale Ale. And meeting me for a couple of glasses is the brewery’s founder and head brewer, Soren Wagner, who also co-founded the bar itself. Having recently hosted a huge party for its fifth birthday, Fermentoren is something of a veteran of the Copenhagen craft beer scene. Returning to MBCC this year for the second time, Soren’s story as a homebrewer turned publican turned brewer is one that charts the rise of craft beer itself. ”As a kid, my Dad would always let me have a sip of his beer when we were doing ‘man work’ together,” Soren reflects. His curiosity about this strange bitter liquid grew and by the age of eighteen he had started brewing it for himself. Slowly, he became more interested in starting his own brewery - first by contracting and ultimately by finding his own location. He was taught to brew by Shaun Hill from the nearby Norrebro Brygghus, who ultimately also paid for his brewing course at the Carlsberg Scandinavian School of Brewing. After completing the course, side by side with his Masters, he found an abandoned dairy in Gorlose, just north of Copenhagen. “The skeleton was there, I just needed to add the equipment,” he explains. And, with that, he was in business and began by creating a number of IPAs that have since become highly rated on RateBeer. “The San Diego breweries have been a big inspiration to the style of IPAs that I’ve been wanting to brew,” he tells me. With ambitions to produce some of Europe’s finest IPAs and sours, he got the opportunity to first showcase his beers at the All In Beer Festival in Gothenburg and at last year’s MBCC. He calls his Christian Bale Ale the beginning of his ‘beers for me’ series, for which he has been creating beers that he loves to drink himself. ”It was really one of those Bob Dylan recipes, written on the back of a napkin,” Soren laughs. Launched a little over a year ago, it has been one of the beers that put this newcomer brewery on the map, along with the likes of his Dank and Juicy IPA and Misunderstood Lager. On the topic of how he comes up with recipes, Soren explains: “I just put whatever is in my mind into a glass.” He’s excited to be bringing his Crimson Queen to MBCC this year: “It’s a young Flemish Red, aged in Burgundy. It takes 400g of black cherries per litre to make – it’s like a dessert in a bottle!” he laughs. During the Beer Week, he’ll be inviting American brewers such as Jester King up to Gorlose to do some collaborations. “I’ve got a couple of foeders that need to be infected by the funk lords of the USA,” he laughs. 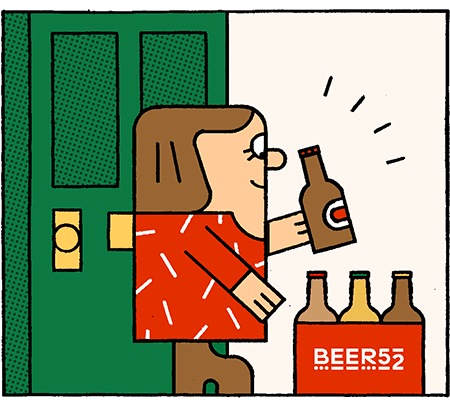 ”The Danish craft beer scene wouldn’t be what it is if it weren’t for Mikkeller; they’ve put this country on the map in beer terms”, Soren says. Having organised a fundraiser party during the refugee crisis, Soren got a sense that beer can be about something bigger. “It was life-affirming. Three kegs became 43 in two days, 700 people came along and we raised £8k,” he says. A DJ on the side, Soren will also be playing funk, soul and hip hop at London Craft Beer Festival. “Our following has really exploded in the UK”, he explains. Thanks in part to having family in the North of England, he has built friendships by attending the likes of the Hop City festival in Leeds. Having done collaborations with breweries including Buxton and Cloudwater, he’s certainly punching above his weight for a brewery that’s two years old.